This home is tiny yet charming. We enjoyed picking lemons from the fruit tree out back and our granddaughter loved to play in the grass. We will return this fall for a longer stay. We had a delightful stay in February in this sunny, art-filled cottage. It has beachy decor and paintings. We enjoyed sitting on the deck at sunset, with its view of "The Rock". The kitchen is well-equipped; it had everything we needed. It is well-located, a 3 block walk to the Embarcadero. Morning walks to the Rock and beach, watching the sea otters along the way, were great. There are many shops and restaurants along the Embarcadero. 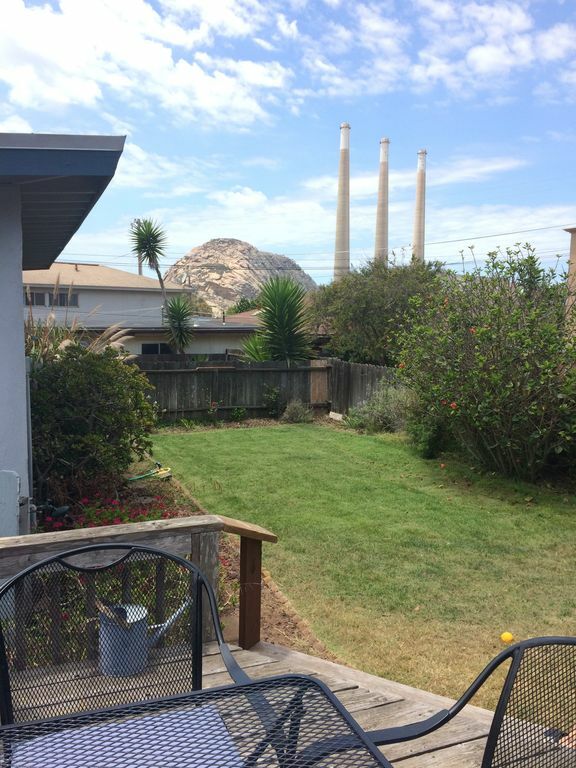 We also found Morro Bay to be a good home base for exploring the Paso Robles wine country, beautiful Cambria, San Luis Obispo, and our favorite beach there, Avila. By the way, the lower bunk bed makes out into a futon bed. With the large back yard and bunk beds, it would work well for a couple with young children. We are planning to return this summer with our grandsons.